The American composer Charles Griffes, much influenced by French impressionism, has a remarkably fresh and individual ‘voice’. I first heard his music – including The Pleasure Dome of Kubla Khan – on a fine Naxos disc that Rob Barnett welcomed back in 2004 (review). Next it was the turn of EMI’s American Classics series, with Peter Lawson’s performance of the Piano Sonata (review). 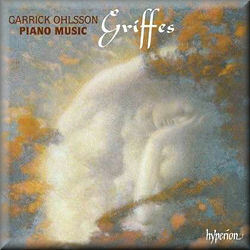 As for the pianist Garrick Ohlsson, featured in this new release, I found his Granados CD ‘long on technique but a little short on temperament’ (review). That said, he’s still a commanding keyboard presence, and that makes him an ideal ‘fit’ for the piano-savvy team at Hyperion. I’ve yet to mention Michael Lewin, who has recorded two volumes of Griffes’ piano music for Naxos, the first of which also met with Rob’s approval (review). A most rewarding collection – sometimes lacking in subtlety and surprise – it’s the obvious rival to Ohlsson; indeed, even the recording is quite good, although it would have to be nothing less than outstanding to compete with Hyperion’s accomplishments in this field. That’s amply demonstrated by the Three Tone-Pictures, in which Ohlsson’s finely graded dynamics and miraculous touch are married to sound of exceptional clarity and realism. The colour washes of this triptych – now cool and aqueous, now murkily nocturnal – are pure, evanescent Debussy; both Lewin and Ohlsson are persuasive here, with the latter just edging ahead with a whirling account of The Night Winds. I suspect some listeners may prefer the diamond-like glitter of Lewin’s recording to the warmer and tonally more sophisticated Ohlsson, but as performances I find both men to be in their element here. Lewin doesn’t include the three Fantasy Pieces – Barcarolle, Notturno and Scherzo – but instead he offers a world-premiere recording of Offenbach’s more famous rolling bark. It’s so gently done, too. Back to the Fantasy Pieces, where Ohlsson finds a hidden vein of poetry and a seamless line. Rhythmically he’s incredibly supple, notably in the deck-tilting Barcarolle, and he builds the most thrilling climaxes as well. What a gorgeous piano sound, and how powerful the propelling bass. Without wishing to devalue Lewin’s fine pianism I could easily imagine his CD playing in the background while I do other things, but Ohlsson’s performances are far too complex and compelling for that. There’s a marvellous distillation of mood in Notturno, where Ohlsson brings a gossamer lightness to those rippling figures. As for the Scherzo it’s dervish-like in its swirl and intensity, and one senses genuine delight in the playing. In the Roman Sketches Ohlsson makes light work of the dazzling, fan-tailed writing of The White Peacock – what a wealth of nuance and detail he finds here – and the ambiguous harmonies of Nightfall. Lewin is more forensic – slightly detached, even – but for all that his sketches are impressively executed. Only at dynamic extremes does the Naxos sound seem a little hard; otherwise it’s more than up to the task. That said, Lewin’s Lisztian fountain plays and plashes with the best of them, yielding only to Ohlsson in the last degree of refinement and colour. Ohlsson’s Piano Sonata certainly benefits from the extra bass weight of his recording, which gives the music a brooding ballast – especially in the Molto tranquillo – that you won’t hear in Lawson or Lewin. The real clincher, though, is Ohlsson’s probing pianism, which seeks to illuminate every last corner of this highly compact score. In the end the real victor is Griffes, whose musical prowess is laid out as never before. Indeed, hearing this piece one realises Griffes isn’t so much a might-have-been – he died so young – as a most-definitely-was. Clear blue water opens up between Ohlsson and Lewin at this juncture, as the latter’s version of the Piano Sonata is too relentless for my tastes. The shallower recording doesn’t help, and the extreme treble is Inclined to be a little fierce. I did warm to Lewin’s Winter Landscape – its cool tones and clear outlines have a starkness that suits the piece rather well – but one only has to hear Ohlsson to realise there’s an inner landscape too. In De profundis the latter is infinitely more inward as well, and there’s a range of feeling here – a vulnerability, perhaps – that Lewin can’t match. Ohlsson rounds off with the three Preludes, which blend the softest brush strokes with delicate points of colour. Enigmatic, aphoristic and a perfect coda to this illuminating collection. The quality package is enhanced by detailed and very readable liner-notes by Stephen Siek, an authority on American music. Hugely commanding and authoritative; a landmark in every way.